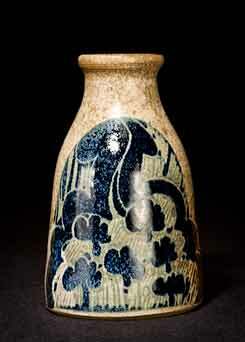 Crich bottle vase - 5⅝" (142 mm) high. Crich Pottery was set up in 1973 at Crich, Derbyshire, by Diana Worthy. Diana had studied at Camberwell, Croydon, Loughborough and the Royal College of Art, and then gone on to design for Denby before starting Crich Pottery with her husband. She works in stoneware and uses a variety of techniques including press-moulding, slip-casting, jigger-and-jollying as well as conventional throwing. Her pots are brush decorated, sometimes with sgraffito designs. She fires in an electric kiln in an oxidising atmosphere.